“Married to Sin” was selected for addition to the Library of Congress’ genealogical collections, and rated a 5 for relevance. It can be read in the Local History and Genealogy Reading Room in Washington, DC. (on the shelf with other great books like Roots, Jubilee, etc.). We’re so proud. “Married to Sin” Library of Congress – Genealogical Collection. 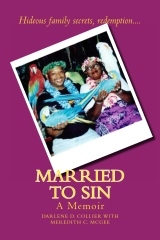 Join us Tue, June 19th at 11 AM – Charles Tisdale Library for a Book Reading/Signing with authors of “MARRIED TO SIN” Darlene D. Collier and Meredith C. McGee. BUY NOW! http://www.mosedpress.com – Comments from readers: “Married to sin brought me to tears.” – “I couldn’t stop crying and couldn’t stop reading.” – “A must read for psychology majors.” – “Collier is a strong woman.” 601.372.0229 – 601.706.4656 for more information.